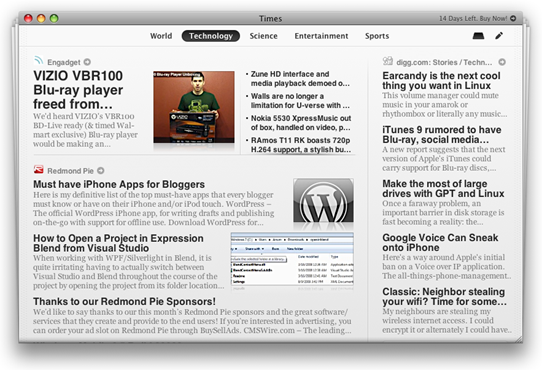 Times is a unique RSS application for Mac platform with an interface designed to make it look like a newspaper. 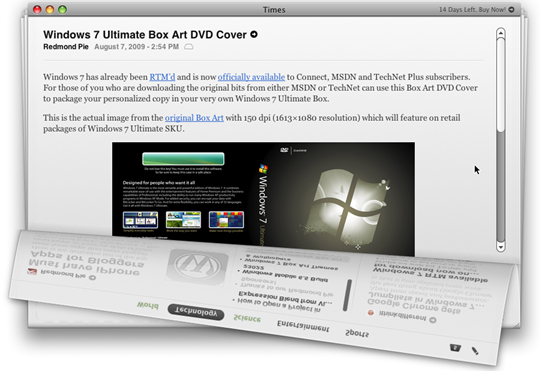 The devs at Acrylic Software have done a fantastic job on making RSS feeds a treat to read! Many people, including myself mostly use Google Reader or Windows Live Mail (on Windows) to read RSS which are both powerful and cool, but the experience they provide is mostly bland. With Times, you get an experience, that is familiar to the traditional newspapers you read! I love the way how the app is fully customizable, you can customize the layouts according to your needs from different feed sources for featured, main and sidebar sections of the app, just like a newspaper! The user experience which this app provides is simply jaw dropping. This app will actually make you read your feeds unlike other RSS apps like Google Reader where you are always stuck with 1000+ unread feeds (yea.. it happens with everyone). And yes, you can share the news on your favorite social networking sites like twitter and facebook with a click of a button; a feature which most RSS apps lack. 1. No sync option with the most popular cloud-based RSS reader i.e. Google Reader. 2. 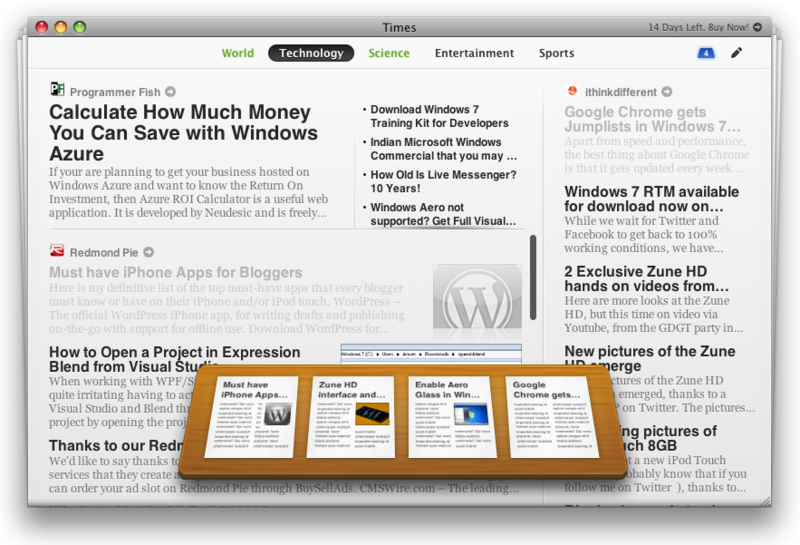 Being a full time Windows user, I would love to see the devs bring the cross-platform compatibility – specially for Windows (something like The New York Times Reader). 3. An iPhone port of this app with synchronization option would make it a great companion on the go! 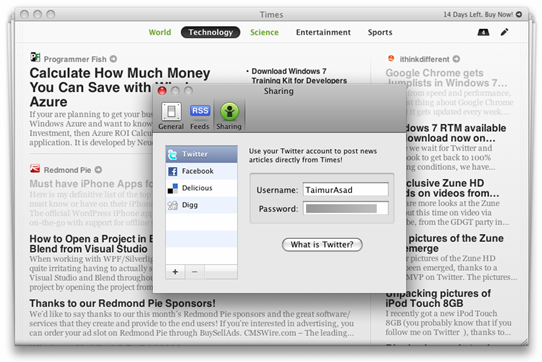 Times requires Mac OS X 10.5 or later. I think that it is a really cool app and if I had a Mac I would certainly download it. 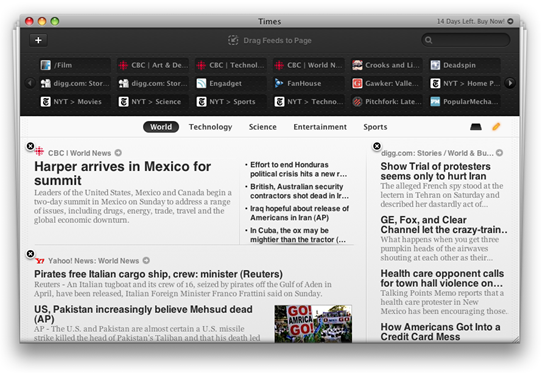 However I do feel that RSS feeds are annoying and I prefer webslices in Internet Exoplorer. 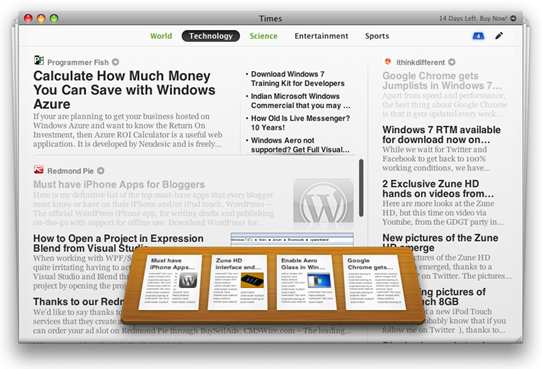 I think that RSS feeds should be intergrated better with browsers so that you don’t have to have an extra application.